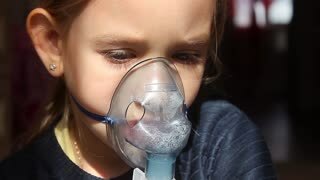 The child suffocates with asthma. A sick little girl breathes a nebulizer. Cosmetologist works with a nebulizer after the procedure, eyelash extensions. Procedure of eyelashes extension in salon. Master cosmetologist works with a nebulizer after the procedure, eyelash extensions. Procedure of eyelashes extension in salon. Sick man inhaling through inhaler nozzle for nose. Close-up nose, side view. Use nebulizer and inhaler for the treatment. Preparation for inhalation. Nebulizer, mask and medicine on the glass table. Unrecognazable woman with mobile phone. Use nebulizer and inhaler for the treatment. Young woman inhaling through inhaler mask sitting on the sofa. Woman puts medicine in the part of the inhaler. Hands close-up. Medicine for inhalation and nebulizer on the glass table. Use nebulizer and inhaler for the treatment. Young woman inhaling through inhaler mask. Close-up face, side view. Use nebulizer and inhaler for the treatment. Young woman inhaling through inhaler mask. Close-up face, front view. Use nebulizer and inhaler for the treatment. Young woman inhaling through inhaler nozzle for nose. Close-up nose. Use nebulizer and inhaler for the treatment. Young woman inhaling through inhaler mask. Close-up face in mask, side view. Use nebulizer and inhaler for the treatment. Sick man inhaling through inhaler mask. Close-up nose and lips in mask, side view.